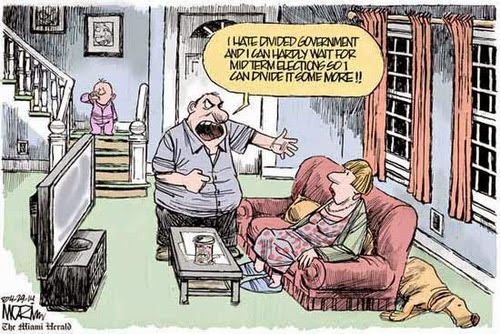 The Dividist Papers: It's unsustainable, stupid. This graphic compares U.S. debt and deficit with the dysfunctional Eurozone economies. 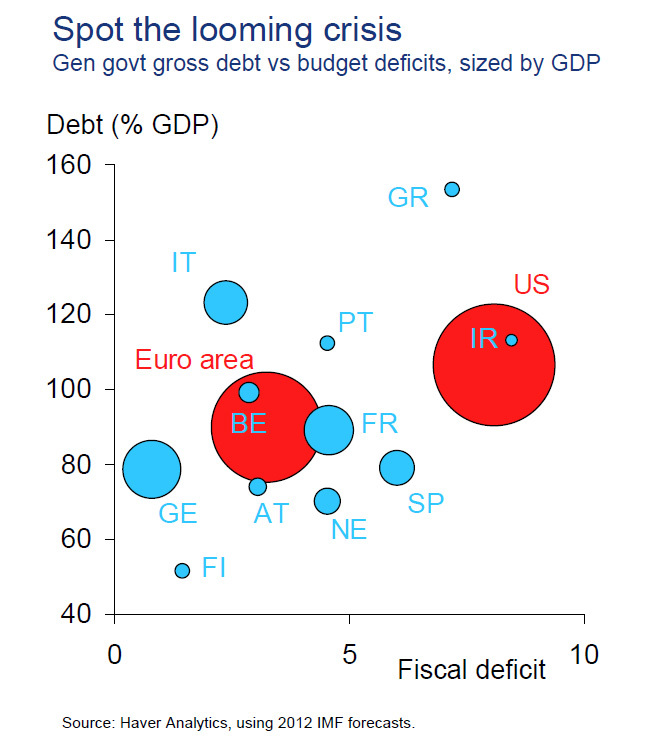 Interestingly, only Greece is worse than we are vis-a-vis the dual metrics on the chart. We tie with Ireland. Other than that, we are worse than all of industrial Europe. If our politicians across the political spectrum agree that our fiscal debt situation is unsustainable and potentially catastrophic, and they do, should this not be a critical issue in the presidential campaign? In the 1992 presidential campaign, Jame Carville's motivational meme "It's the economy, stupid." perfectly encapsulated the key issue of the election. The beauty of the exhortation was that it focused the Clinton campaign staff on the one issue that could and would make a difference in the electoral outcome. He correctly identified the single most important issue on the minds of the electorate and it also exposed the single greatest weakness of the George HW Bush administration. The Bush campaign seemingly never understood what the election was really about. They touted foreign policy triumphs and their consequent lack of focus on the domestic economy reinforced the perception that President Bush was out of touch with American voters. In every election since, campaign strategists, analysts, pundits and bloggers have attempted to reprise Carville's insight with a similar construct for the election at hand. Your loyal blogger is no exception. In 2006 and 2008 the Dividist was convinced the election was about one thing: "It's the war, stupid." True enough in 2006. Not so much in 2008. In 2008 "It's George Bush, stupid." was enough to win the election for Barack Obama. Even though GWB was not running, it was sufficient to tar McCain with that brush. The public sentiment was to punish GWB and the Party he rode in on. 2010 was a different story. 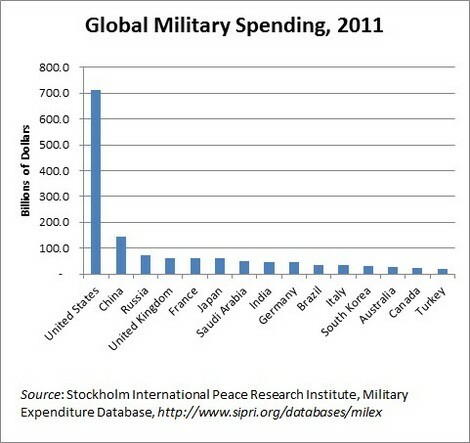 In 2010 - "It's the spending, stupid." carried the day. Which brings us to 2012. After winning a battle, generals are reluctant to abandon the very tactics that prevailed in a victorious campaign. Despite the setback in 2010, Axelrod and the Obama campaign strategists continue to fight that 2008 war in 2012. It's a mistake. Things have changed. 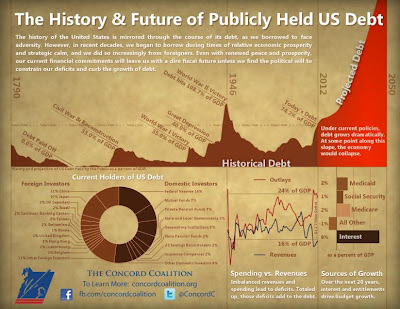 Today there is a far greater awareness and focus on our profligate and unsustainable deficit spending. These charts are not new. We've been on this path for decades. The GW Bush administration made it worse with a trillion dollar war and a trillion dollar prescription drug entitlement initiated during their four years of One Party Republican Rule. The first two years of the Obama administration made it much worse with two new trillion dollar spending programs passed in just two years on on two purely partisan votes under One Party Democratic Rule. "Unsustainable" is on the mind of the American electorate. Watching the fiscal meltdown in Greece and Italy and Spain and Portugal have put it on the front burner for this election. This is not where we want to be, yet our leadership in Washington D.C. continue to walk us down that primrose path. Time is up. 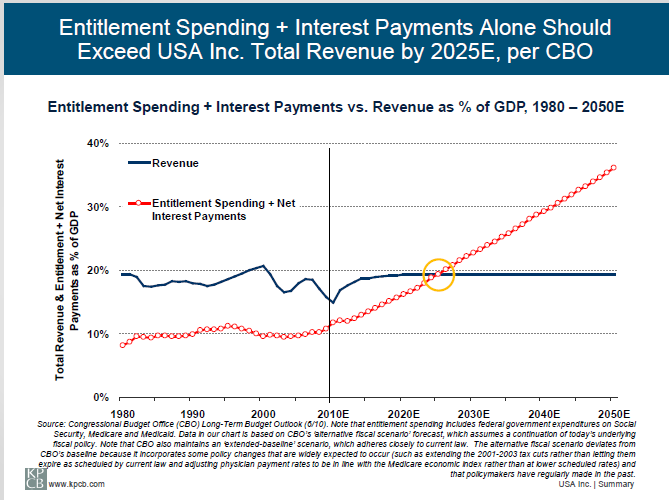 Time to move from "unsustainable debt" to "sustainable debt". This should have been clear to the Obama administration after the midterms. The Simpson-Bowles President's Commission on Deficit Reduction was a perfect opportunity for President Obama to take the lead on this issue. He let it slip away. Now here we are, two years later, and the Obama campaign seems to think the most important items on the minds of Americans are Romney's tax returns, Bain Capital, whether Romney is too rich to be president, and whether 1% of Americans don't pay enough taxes. None of which does anything meaningful to address the fact that we are trapped on board a hell bound train called "Unsustainable" barreling at high speed toward a cliff of fiscal oblivion. You may not like the Romney/Ryan plans for dealing with our unsustainable spending, debt and entitlements, but at least it is a substantive plan and they are willing to talk about it. 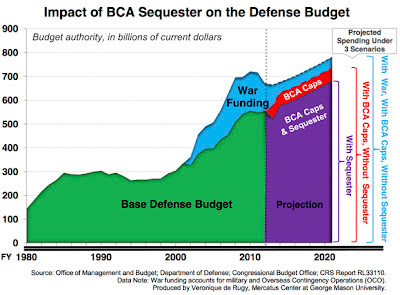 If the Democrats and the Obama administration have a sustainable fiscal plan for the United States Government, and they sure seem like they want to talk about anything else. If the choice in 2012 comes down to a choice between a ticket with a serious plan to get us out of this morass vs. a ticket that appears to ignore it - the man with the plan wins. 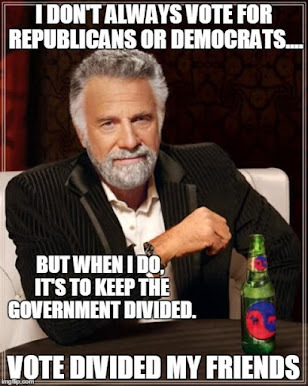 The Dividist has no interest is seeing a restoration of One Party Republican Rule in 2013. The House is a lock for the GOP. The Senate is a tossup and could easily go Republican. The best chance for avoiding a Republican sweep is to reelect Barack Obama. But if the American electorate have the Euro failure and fiscal sustainability on their mind while President Obama and David Axelrod are talking about Bain Capital and more spending increases, well - that makes him appear as out of touch as George Herbert Walker Bush in 1992. The Dividist may not agree with James Carville's politics, but we are still curious what the successful political strategist thinks about the current 2012 Obama campaign. We know what he thought last year. We know what he thought in June. We know his last fund-raising e-mail had the distinct whiff of desperation. In fact, we know more about Carville's opinion on the Obama campaign than we know about how the President intends to put this country back on a sustainable fiscal path. And that is a problem for the president's reelection prospects. UPDATE 8/21/12: Corrected sentence on One Party Republican Rule per commenting stickler. Um, you keep using that figure. One name: Jim Jeffords. Make that FOUR years. "The GW Bush administration made it worse with a trillion dollar war and a trillion dollar prescription drug entitlement initiated during their four years of One Party Republican Rule." Somewhat. I also note MCR part D could not have passed without the 9 votes it got from D's in the Senate to boost it over the filibuster threshold. Kind of tough to rant about one-party rule there when 20% of your caucus defects to get it passed when they could have blocked it. 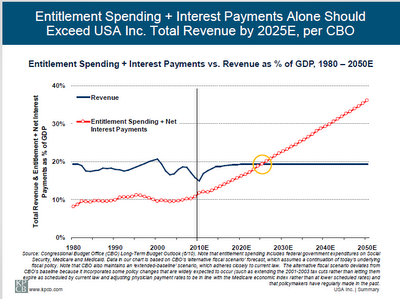 Also as I previously noted elsewhere, a major chunk of our public debt is money the government owes itself. This is not counted against any other nation as they don't play that accounting trick with themselves. In short, that chart is misleading, not being an apples-to-apples comparison.